The pear trees by our home have bloomed almost overnight – the indisputable sign of spring in February! While I do feel, we are completely cheated out of winter this year, I cannot but grin ear to ear to see the tender sprouted leaves and the pink and white blooms. Spring is poetry. The weekend whizzed by in a wink. With two parties in our home, I had to rustle up a lot of dishes in very little time. Cleaning up for one quite late into Saturday night soon led to the prepping for the other one from early Sunday morning. It was busy and crazy but the company of good friends always make us happy. 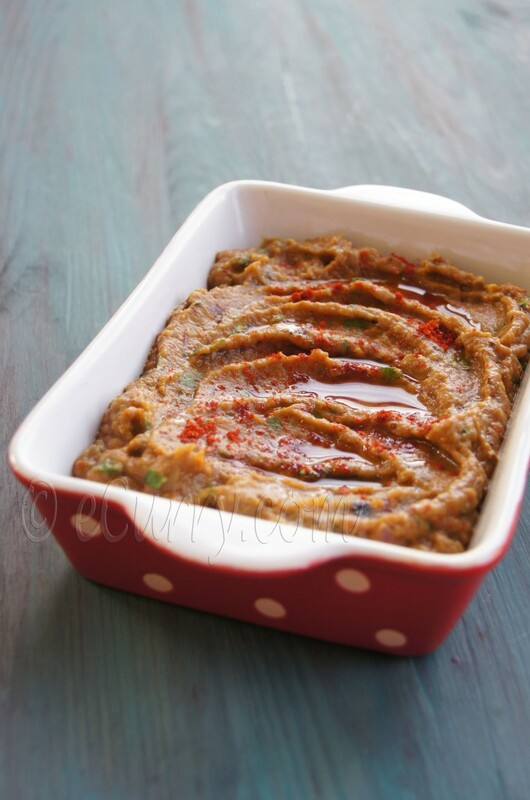 Two of our favorite ingredients were brought in together this weekend; smoky roasted eggplants were pureed with the sun-dried tomatoes and then mashed with peppers, onions and fresh herbs. It turned out to be a bowl of delicious delight. This dip is something I came up with while I am processing the hummus and trying to think of what else I could do for the starters. Right when I had made the sun-dried (oven-dried) tomatoes, I had plans to somehow pair those with eggplants and this was the right time. I grew up loving the humble dish from Bengal, which we call “Begun Pora“(translated simply as “Eggplant Roasted”) – the smoky eggplant flesh is mashed with onion, fresh cilantro and hot green chili pepper along with mustard oil. We usually have Begun Pora with the Roti. I designed this recipe on the same simplicity, but only added the sun-dried tomatoes, and substituted the mustard oil with the olive oil. A takes a scoop and says “Wow, this is good! I never had this before”. Well I say, “that is because I never made it before”. Then he announced that everyone should give it a try, and it was gone in no time. Serve this as a dip/condiment, pesto, spread or even a side dish. If you are using dry tomatoes, reconstitute them in hot water for about 20 minutes or until softened. If you are using sun-dried tomatoes in oil, drain the tomatoes and the oil may be used instead of the extra virgin olive oil. Pre heat oven to broil setting – about 500 deg. F. Slice the eggplants vertically into half. Poke each half on the skin side with fork to make a holes in multiple places. Coat all sides of the eggplant with some olive oil. Line a baking tray with foil. Place the eggplants cut side down and cook in oven for about 30 minutes or until the skin is blackened and the flesh softened. alternatively: The eggplants may be grilled in an outside or stove top grill until the flesh is tender on moist. I will occasionally roast it over the flame of the stove too. Use any method. The stronger the smoky & charred flavor, the better. Remove roasted eggplants from the oven and place them in a bowl and cover it. Alternatively they may be placed inside a ziploc bag. When cooled, after about 15 minutes, remove the charred skin from the eggplant and place all the softened flesh in a bowl. In a food processor, combine eggplants, sun-dried tomatoes, salt, garlic (if you are using) and process with a steady stream of olive oil (saving about a tablespoon to drizzle on the top), until it is smooth creamy puree/mash. Remove in a bowl and combine chopped onions, chili peppers, pine nuts (if you are using) and herbs. Top with the saved oil and the garnish with sumac (or paprika or chili powder). Serve as dip/condiment with flat-breads or chips or veggies, or as spread on wraps and sandwiches or as a side dish. It really works well with everything! 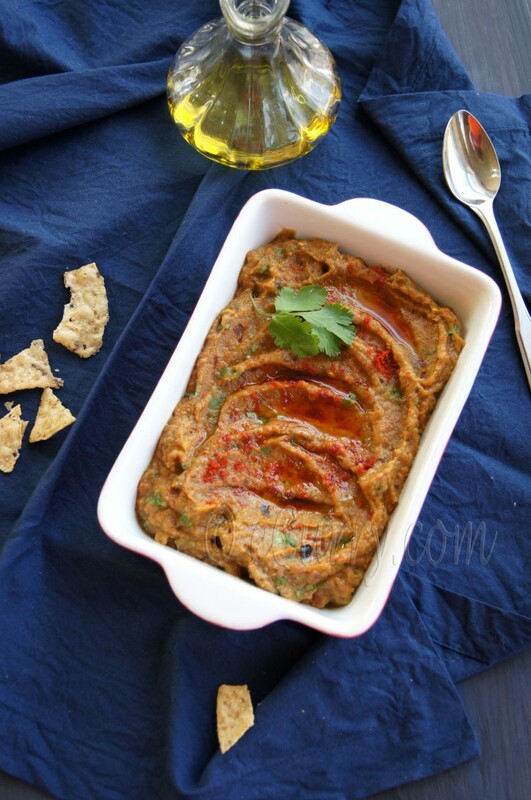 I have been into eggplant-based dips lately–love the use of sumac, chili peppers and sun dried tomatoes in your version. I bet this has lots of flavor! Hey girl, this dish will fly in our house. We are crazed for eggplants. Love all but particularly the snap shot one before last!! Beautiful! Just wonderful!!! 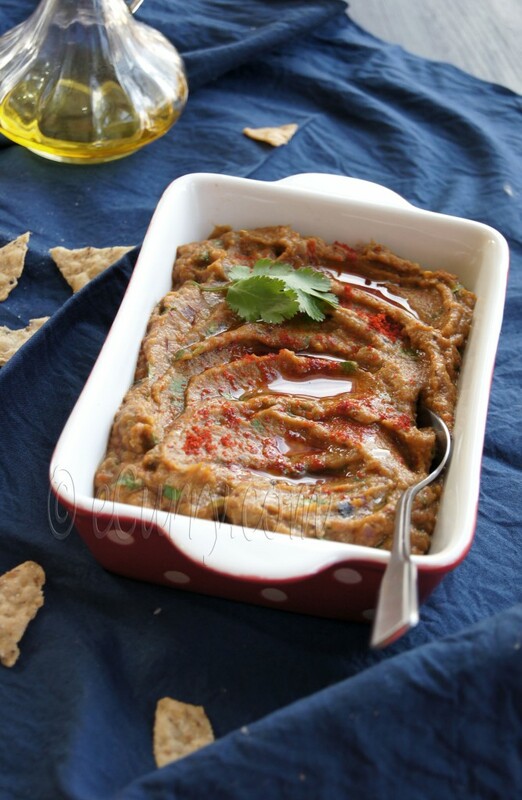 Great eggplant dip. Beautiful pics!! Love Mediterranean flavors and those two are some of my fave ingredients as well. One day, I want to come over and have dinner as your guest! That looks so tempting Soma! eta dekeh begun pora khete icche korche! Never used it as a dip but now I would love to try it. This is right up my street! Will definitely make this next time I have guests. Lovely simplicity. You just gave me a new idea… thanks. I should try something like this for the egg plant haters at my home ,they would never guess 🙂 Lovely ! Simply delicious looking Egg Plant preparation. Wonderfully prepared. Looks delicious! Love roasted eggplant in any way. This looks delish! Hubby and I just ate at a Greek restaurant where we tried an eggplant and mint dip – we couldn’t get enough of it and ordered one to take home as well. This recipe definitely adds another depth of flavour with the sundried tomatoes. I HAVE to try this soon!! Meena! Thank you for stopping by and for mentioning the mint!! I do a quick curry with eggplant and mint and have posted it too. Don’t know why I never thought of mint when I was doing this. I will update this post that mint may be used 😉 I think it will be really fantastic. I will try mint instead of cilantro or may be both next time. This looks delish! Hubby and I just recently ate at a Greek restaurant where we tried an eggplant and mint dip – we couldn’t get enough of it and ordered one to take home as well. This recipe definitely adds another depth of flavour with the sundried tomatoes. I HAVE to try this soon!! Lovely flavors. I could make a meal of this and some hearty crackers. Soma, my all time two favorite ingredients you have managed to combine beautifully into this tasty dish! love the spiciness of the green chilies as well! so delicious Soma. Going to try it this weekend! Soma, thanks for your comment and the info. I saw it on Namitha’s FB page. have commented on desifoodbuzz’s page also. they have taken down the links but excerpts of the posts and the cover photo is still there. dont know how to deal with that. ei bachor amio sun dried tomato baniechi. all thanks to Kolkata’r roddur. tomar ei dipta asadharon. 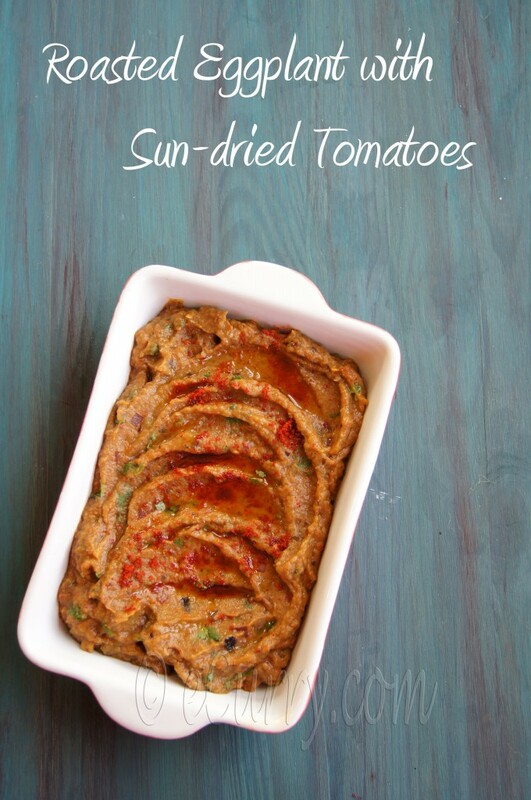 ami hung curd die baniechi but now that I have sundried tomatoes…gonna try this real soon. That looks totally delicious Soma. 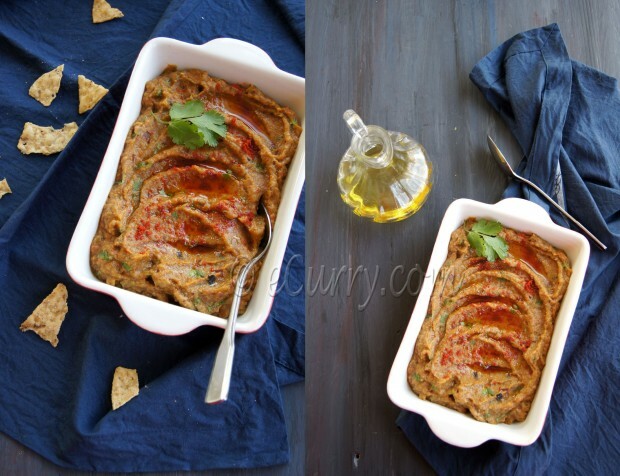 I love eggplant and I love sundried tomatoes so this will be perfect! You have awesome collection of recipes and the pics are marvellous. I once had “Begun Bhaja” at my friends place and find it super delicious and “hatke”. I was looking for it here, but could not find. Please direct me to the link if available. If not, please plan to post in future.